Our edible image printing service uses icing sheets and edible ink to create great quality images to place on your cakes and other edible items. Adding images is a great way to personalise a cake and create unqiue designs that will add the WOW factor to your finished cake design! Our standard printing is onto a 7" x 10" sheet but we can also print 2" round cupcake toppers (12 per sheet) or 1.5" toppers (24 per sheet). When printing cupcake toppers, all images must be the same design. The cost for this service is £7.99 per sheet and you can either email us an image or call into our Nottingham shop and we can scan any photos that you'd like us to use. Email us at michelle@sweetsuccess.uk.com with your image and size requirements and we'll do the rest! These images are easy to use and simply peel away from the backing paper! In hotter temperatures, the images may stick to the backing so we advise popping the enitre sheet in the freezer for a few minutes which should harden the icing enough for the images to 'pop' off the backing sheet more easily. 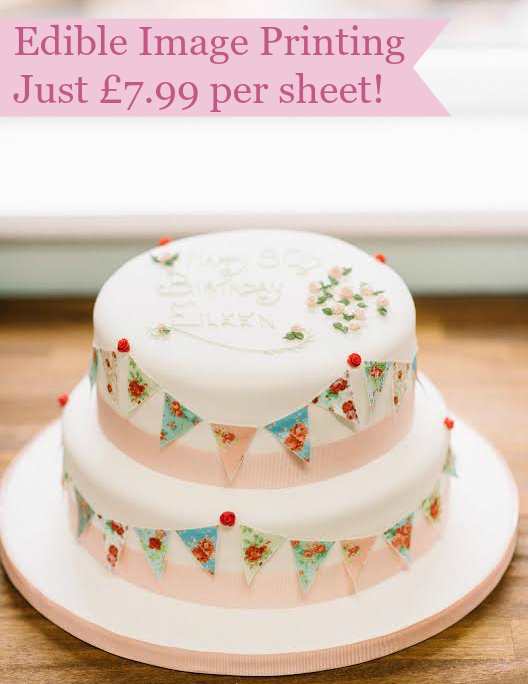 To create the design above, we printed the bunting onto a sheet and handcut the bunting before attaching it to the cake with a little edible glue. We advise allowing up to 24hrs for your printing especially during peak times, if you have any further queries about this service then just give us a call on 0115 845 0660 and select the 'shop' option on the menu.